Apple has been talking a lot about HTML5 and open technologies, so much that they even created a page for HTML5 iPad-ready websites and wrote a popular "blog post" about the problems of Flash as a closed platform and the need to support new standards. But as you probably know, Apple doesn't actually fully support HTML5 in its flagship browser, the desktop version of Safari. Indeed, Safari for Mac (and Windows) doesn't have official and full support for many HTML5 specs like Geolocation API, Drag and Drop, Form Features and Inline SVG but according to this new email from Steve we received, all this stuff is coming. MacStories reader and developer Eugenij Sukharenko sent an email to the man himself, asking about "full HTML5 in Safari, including the Geolocation API". Steve replied from his iPad in one of his proverbial responses: "Soon". 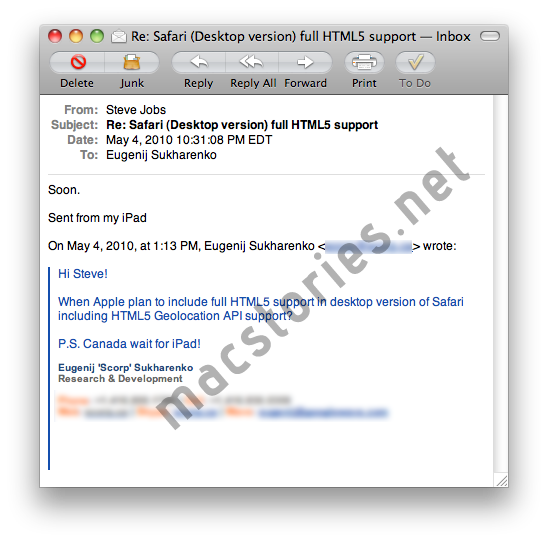 When Apple plan to include full HTML5 support in desktop version of Safari including HTML5 Geolocation API support? P.S Canada wait for iPad!" Whether he's talking about full HTML5 support or just the Geolocation API we don't know, but I'm more orientated towards the first one, considering the subject of the email ("Safari full HTML5 support") and the fact that Apple has been promoting this technology so much that they need to update their desktop browser as soon as possible. It's always nice to have a confirmation from Steve Jobs. 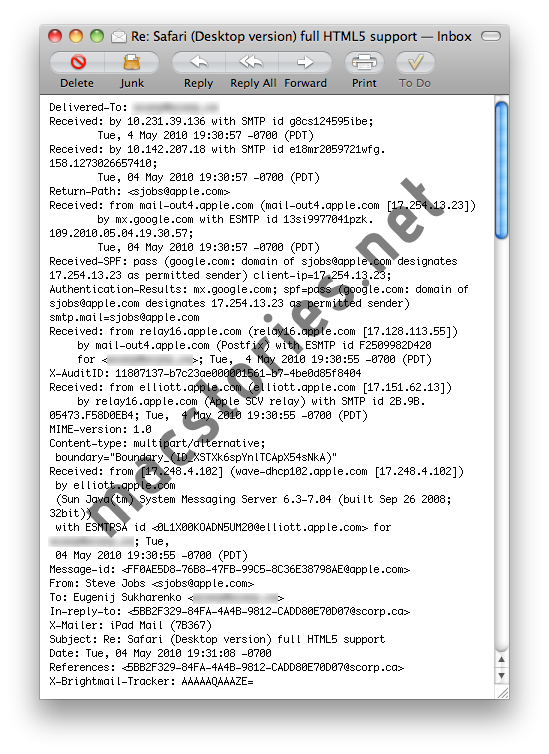 We have the screenshots below, together with full headers.